Many people have previously written Michael Jackson off as a creepy, melt-faced loon whose bizarre antics have directly contributed to his very public demise. Last night, those nay-sayers were firmly told where to go, after MJ (that’s what we, his fans call him) shook up London in a storm of glamour, children and warbled lines. The rumours started a few days ago. Those in the know started saying that MJ would be making an appearance at the World Music Awards (which sounds suitably vague and meaningless as to have been invented by the King of Pop himself!). As fans and other misfits flocked to London in order to prance and moan in the traditional ‘love you / hope you die’ spectacle, Michael Jackson sped through the city in a black limousine, about to make a triumphant comeback which would rock the pop world and briefly rank as the sixth piece in BBC News’sÂ ‘Other top stories’ section. Still, he was pursued by uncertainty and mystery… would he sing? would he not sing? if he did sing, what song would he sing? if he didn’t sing, then why not? if he did sing, would he attempt another misguided set-piece to prove how much he loves ‘the kids’? Yes, no, We Are The World, N/A, yes. The man himself arrived at wherever the venue was and showed off his new face. More angular than previously thought possible, Michael’s cheekbones now appear to have been fashioned from china clay and then kilned for several days – a look which Victoria Beckham will agree is very much ‘in’ this autumn. MJ insisted to staff outside the theatre, or whatever, that he had never planned to sing that night and there had been a misunderstanding. But that was just another clever trick from The Most Important Man In The History Of Musicâ„¢! Because he was planning to sing and he knew that all along!Â With a choir of more than twenty minors, MJ danced to a tape of his classic masterpiece in fatuous sentimentality, We Are The World. At one point, Michael joined in with the recording, moaning the words to the chorus softly as he was clearly out of breath. Despite being nearly 60, the great man still knows how to feed off the energy of the innocent souls around him. And I think that this is what makes him so great. Cheers, Michael! I don’t know if it’s a typo, but ‘Despite being nearly 60’ is off the mark by 10 years, although he might look and sing like he’s 70, he’s actually closer to 50, isn’t he ? Hmm yes you are technically right. But I always round to the nearest 60 rather than the nearest 1. Elvis… his first album is just awesome. But in the end, he’s as over rated as Michael Jackson. I prefer Chuck Berry. Elvis is alive, I saw him last year in Los Cristianos in Tenerife. He’s lost a bit of weight, and I can’t remember the name of the pub he was singing in – but he’s still got the white Las Vegas suit. 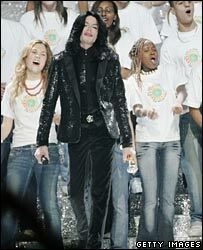 We Are The World was written by Michal Jackon and Lionel Richie (LR). Lionel Richie does not shag kids, but he also didn’t write Thriller, Billie Jean or Beat It! “feed off the energy of innocent souls”, my oh my. MJ looking awful as usual.